This is a very fun project that I use to help students focus on their pronunciation in Spanish. It can be used for both middle and high school students. I let my students choose the songs that they want to use, but you could also give them a category that they have to choose from, ie. Disney songs. 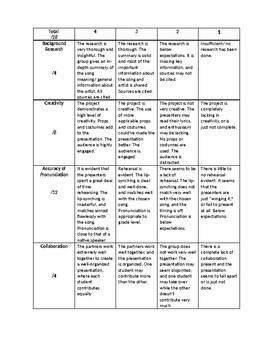 This product comes with the editable project outline, as well as the editable rubric for grading. Because it is editable, it would take about 2 minutes to go through and adjust it for any other language besides Spanish! 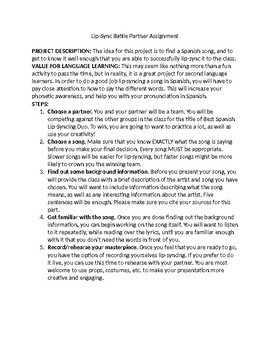 The idea is that students work in partners to practice lip-syncing a Spanish song. They have to do a little bit of background research on the song and artist as well. They then compete against the other groups in the class for the title of 'Best Lip-Syncing Duo.' I have Spanish prizes that I will give out to the winning group. The winner is decided by vote after all the presentations are done. They can't vote for their own group, and have to write down the group they believe was the best. I tally up the votes and add my own vote as well. I always give my students a little inspiration by showing them a Jimmy Fallon Lip-Sync battle when I introduce the project. The Paul Rudd vs. Jimmy Fallon one is good! This is a great project for working on student creativity, as well as really getting them to focus on pronunciation in Spanish. Enjoy!